Zamami Island is 24 kilometers in circumference. The island is organized from 3 communities, which are Zamami district, Ama district, and the Asa district where stores and diving shops locate and popular to many young men and women. The sea around the island is a mecca for divers, and there are many scuba shops on the island. The high clarity of the water offers the excitement and fascination of diving to many, from beginners to experienced veterans. In addition, Ama Beach and Furuzamami Beach have a campground so that visitors can enjoy camping and swimming. With its most of the land covered by forests, this island still preserves natural landforms such as sheer cliffs along the sea and sea beach. 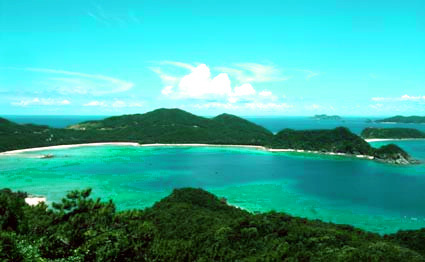 The island is bordered with coral reefs in the sea which boasts its beauty and high-level of transparency to the world. 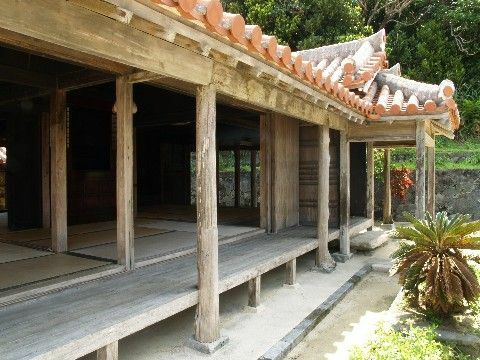 Visitors can also enjoy the beautiful scenery from the top of Mt.Takatsukiyama and visit the Kerama Maritime Museum. 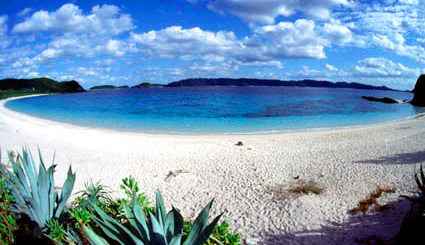 Zamami Island is also known as a good whale watching spot. Visitors can see dramatic breachings (leaping clear out of the water) by the humpback whales during the January-April season. There are also unexplored beaches that you have to wade through flourishing plants on the way that you can enjoy some taste of adventure. You can watch beautiful landscape of vast sea with coral reefs and surrounding islands from 5 view decks set between mountainous lands. In winters, whale watching to see humpback whales travelling the surrounding sea areas attracts lots of travelers. There are three deserted islands nearby that you can access from Zamami Island by the ferry. It may be also fun to produce your original deserted-island tour by yourself and enjoy the great nature. Zamami Island is in the center of the Keramas and Zamami village seems to be the island group’s biggest metropolis. Zamami village is the port and main village of Zamami island and is also where you will step off if you go by ferry. There is only one stop light in the main village and it seems to only be there to instruct the native children and to justify having a police station. The biggest thoroughfare through the center of town is basically a sidewalk, but it is lined with some great izakayas (restaurant/bar) and minshikus (guest houses), dive shops, a few gift shops, a general store, medical clinic/ town office, bike rentals, and a kiosk that makes delicious mango ice! After touring Zamami village, if you want to get a bird’s eye view and see the Kerama islands in all their natural beauty, you should take a taxi bus (or rent a bicycle for some exercise) and go up to Takatsuki viewpoint, at the top of one of the highest peaks on the islands. There are four lookout points like this, but Takatsuki offers a great view of the village to the south and the islands all around, for a truly inspiring scene. Don’t forget your camera! On your way down from the viewpoint, ride your bike to Furuzamami beach, east of the port or along the water to Ama beach. Either of these beaches is a great place to relax and spend the rest of the day. At night, you will probably end up at an izakaya, maybe La Touque, where it seems everyone meets up. If you are going to Zamami by private yacht, it is recommended that you sail into the main port and moor out of the way on the older- far seawall to the east. It is only a short walk into the village from here and this is the public seawall that is not reserved by other boats. You could also anchor in Agonoura Bay - the big bay on the east half of the island. The four buoys set in the bay are strong enough for ships to secure to in a typhoon. However, if you moor here you will need to dinghy to shore and either camp on the beach or hike into town. Ferries of Zamami Sail Across the Beautiful Sea Zamami Island is about 24 km in circumference. It takes 50 minutes to get to there by speedboat, two hours by ferry from Tomari Port in Naha, and 15 minutes by air. Zamami, surrounded by beautiful sea and coral reefs, is a Mecca for divers.